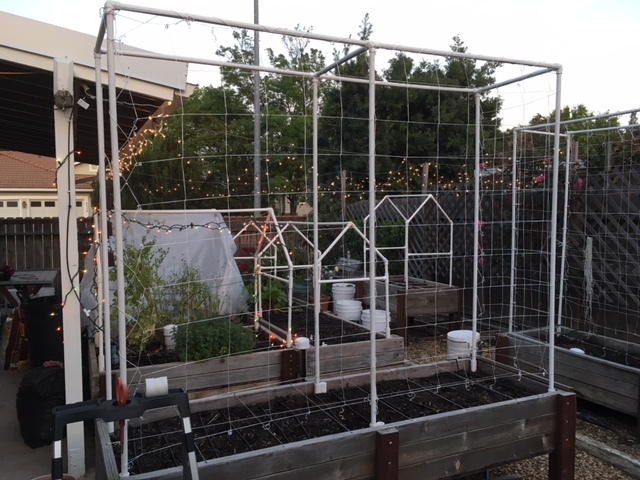 This evening, I started installing two 5' x 8' nylon trellis meshes on the 2' x 7' bed. 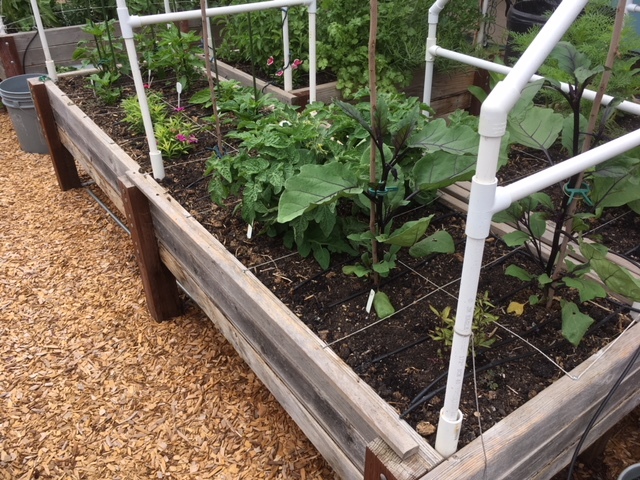 For permanent trellises, I use zip ties. 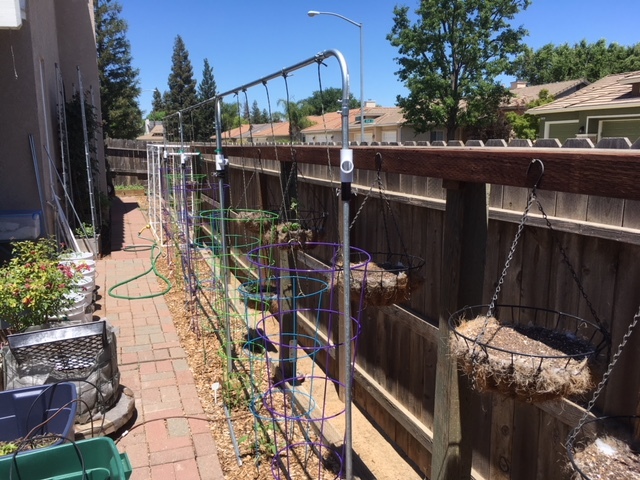 These trellises are temporary for indeterminate tomatoes and will be taken down Oct. 1. So, I'm just "whip stitching" the meshes with cotton string. One mesh up. @sanderson wrote: This evening, I started installing two 5' x 8' nylon trellis meshes on the 2' x 7' bed. 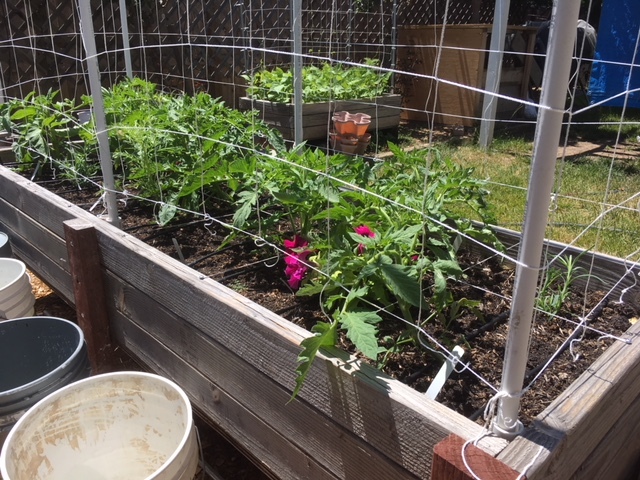 For permanent trellises, I use zip ties. 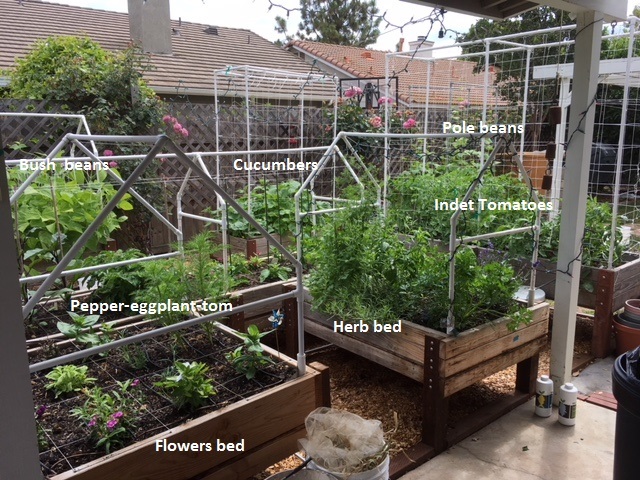 These trellises are temporary for indeterminate tomatoes and will be taken down Oct. 1. So, I'm just "whip stitching" the meshes with cotton string. One mesh up. Can't wait to see this shot again in a couple of months. Should make a great before/after scenario. The way my seedlings are looking, I'm hoping there will be life! 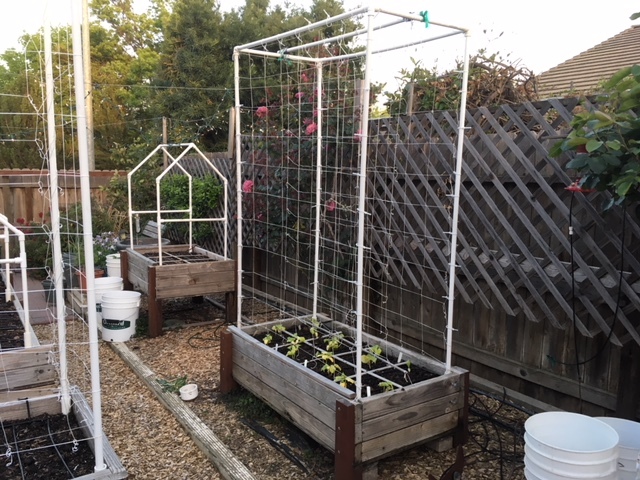 Converted the double trellis into a triple trellis for the cucumbers. 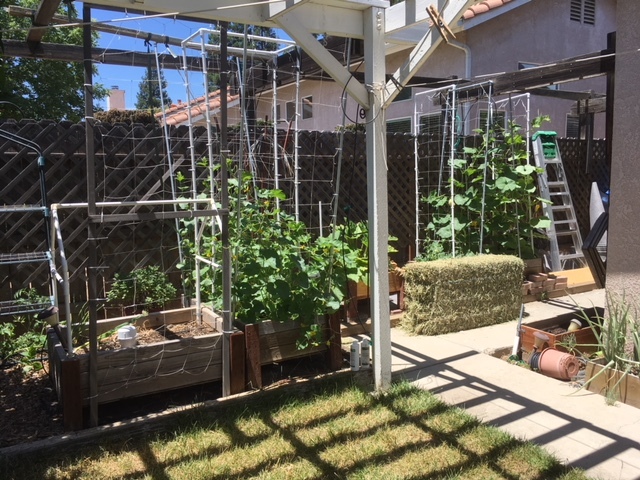 @sanderson wrote: Converted the double trellis into a triple trellis for the cucumbers. 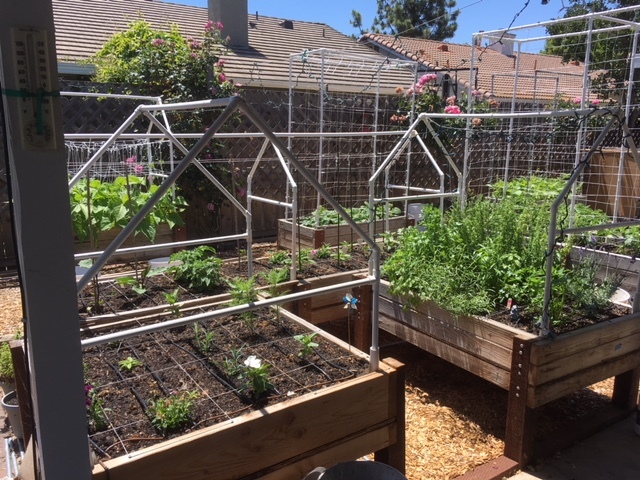 Despite being sick and only being able to water to keep things alive, the garden is looking better. If you go back to page one, you can see the bare garden before photos. View towards south, slightly west. It shows 7 beds. West garden. Fore left is crazy New Zealand spinach and some walking onions. Fore center cantaloupe. 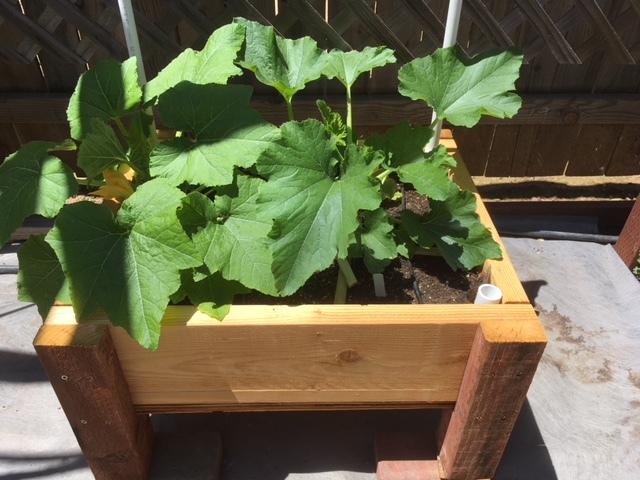 Back center - new summer squash bed. 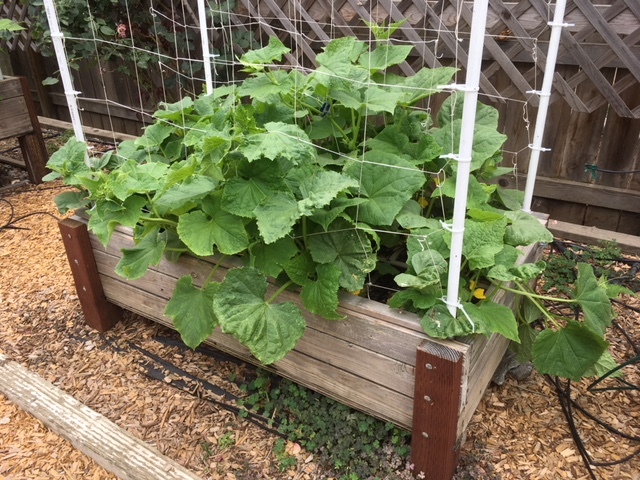 Back right - winter squash and 2 watermelons. Closeup of the tomato bed above. Tomatoes and flowers in 2' x 7' Table Top. 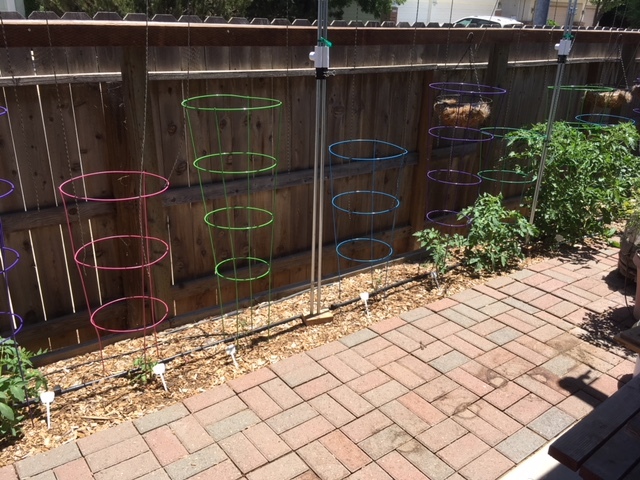 BTE tomatoes EMC trellis. Before wood blocks and braces added and aligned. One PVC brace showing. Corn cage started in the back ground. Are you starting to feel any better? Everything looks so pretty and clean. Congrats on some hard work there,. Hope you are feeling better. Sanderson...your work is incredible. I see many hours of joyful thinking in your photo's. You certainly get a lot into your small spaces, sanderson. I do hope you are feeling much better. Thank you, folks. It only looks so pretty and clean because it's SFG. The area on the patio is a swirl of leaves, spilled MM, dust, and clutter, which I started cleaning and then got sick. It will have to wait a week. I'm feeling better each day now. We are leaving Thursday for Missouri and will be flying back on Monday. The top priority is to get 3 trays of starts into an area where they will be watered and not eaten by snails and slugs until we return. 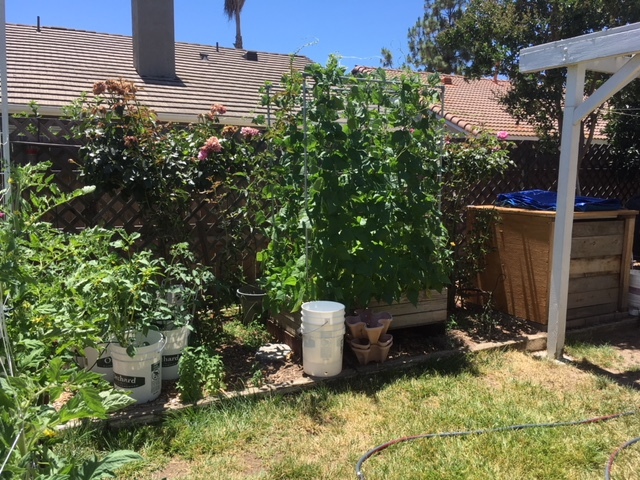 Plus 3 buckets of tomatoes and a tomatillo. Glad you're feeling better! And it looks great. I love your garden! So jealous of both your energy and your lovely set up. I'm glad you're feeling better. 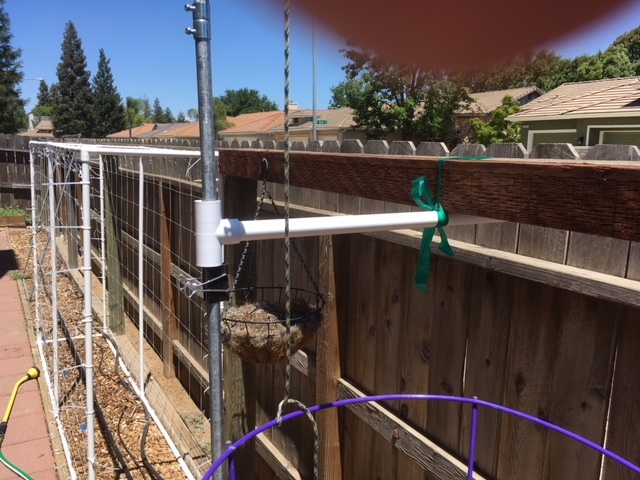 In this photo, I'm wondering about the bracing - does the PVC go all the way over to the fence wall, or is the tie to the wooden bracket enough to keep everything braced? 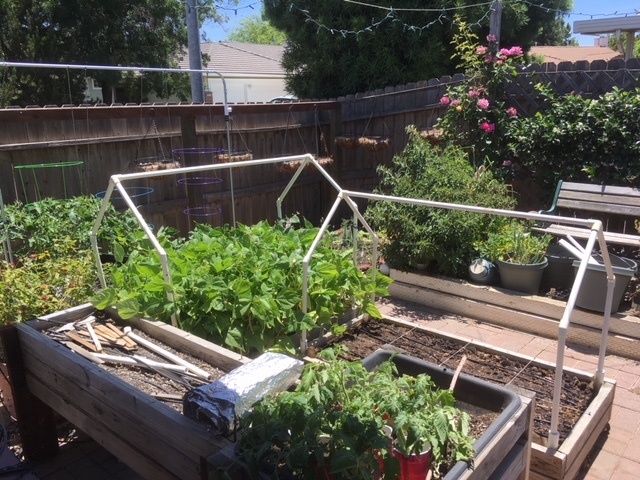 I'm just wondering if the brace is helping to hold the weight of the tomatoes once they're that tall, or if it's more to keep the EMT straight, or ...? I have so much to learn. BJW, Thanks. The brace is only to maintain vertical alignment. 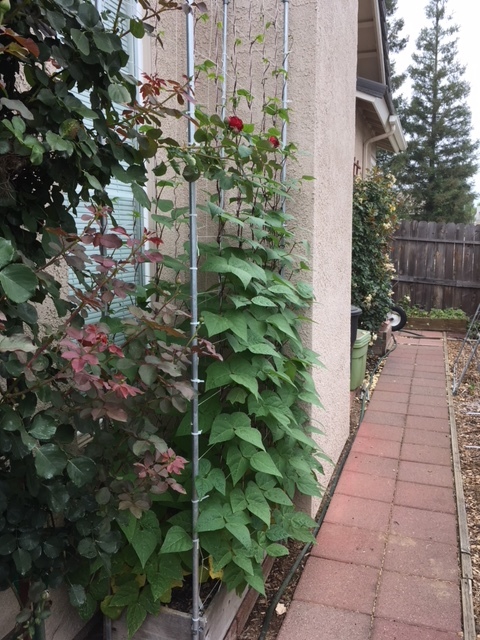 It was purchased pre-cut in 2' lengths at HD and does NOT go all the way to the fence. The green stretchy garden tape should be sticky/stretchy enough to hold. 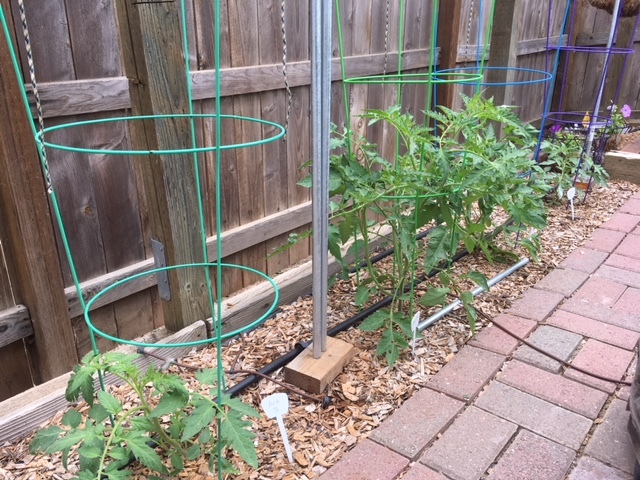 The tomatoes will be supported by the strings (paracord) tied to the overhead horizontal EMC. Eleven (11) days later, 5-25-18. 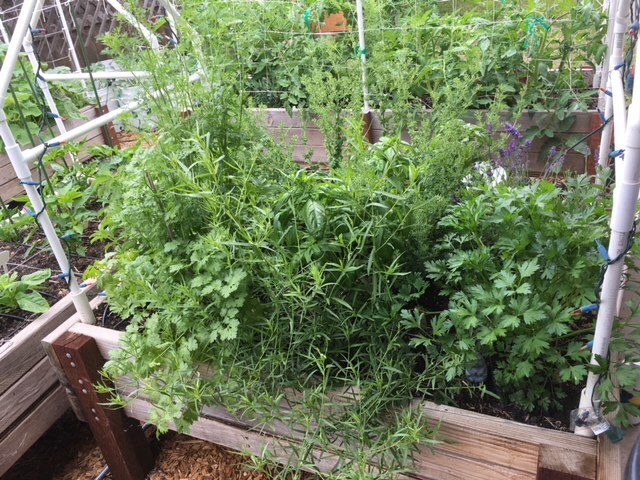 Herb bed. I cut the oregano as it is starting to bolt. 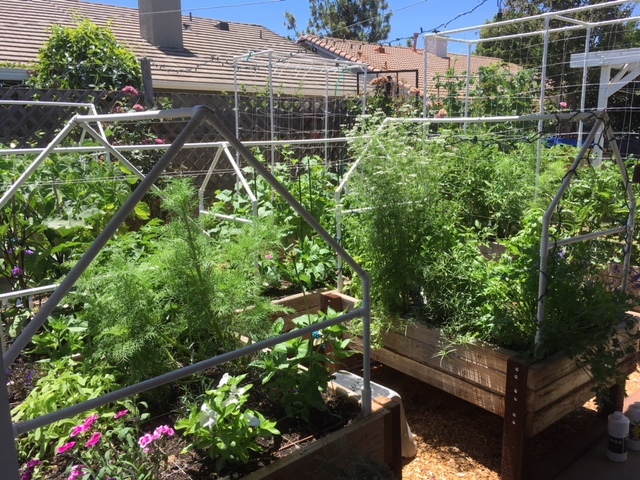 The cilantro on the left is also bolting and needs to be harvested, maybe even removed. 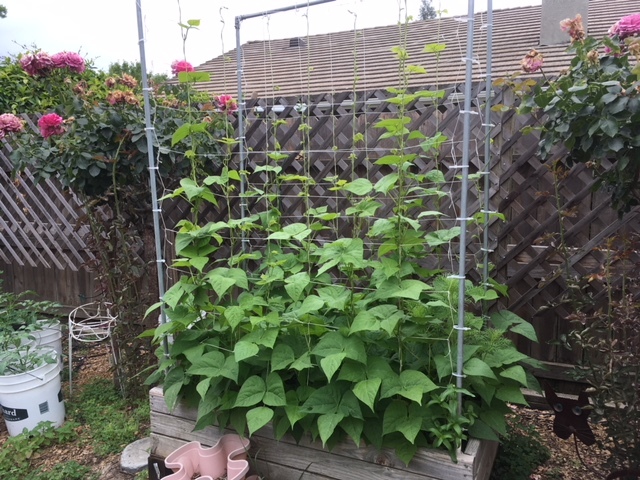 It is a good winter plant for this area of CA. Dragon Tongue beans and sweet potatoes. 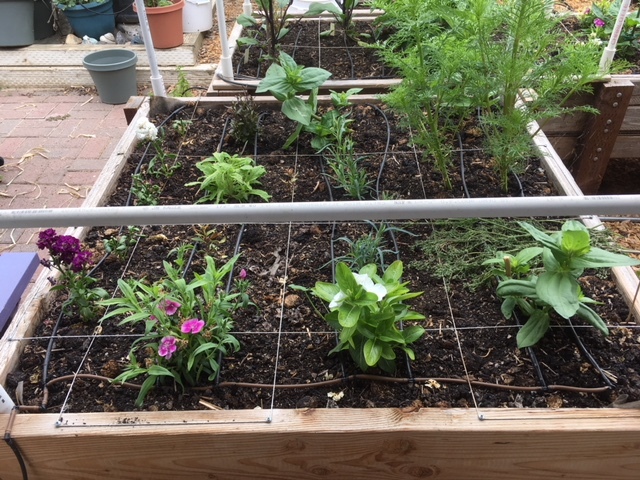 In-ground flower bed, emergency planted seedlings. Foreground, 2 Japanese Millionaire Eggplants. Next 2 compact Snow Fairy tomatoes, background left: peppers. Part of the BTE tomatoes. These 4 are the best of 9. I don't know why the other 5 are puny. Can you hear them growing when they go that fast? Your purple podded beans are as pretty as any ornamental. You've done an amazing job with everything in your yard. Thanks. Right now everything are as perfect as they will be. In a month, the plants will be screaming from the red spider mites and moaning in the heat. As long as they produce, I will fight for them. 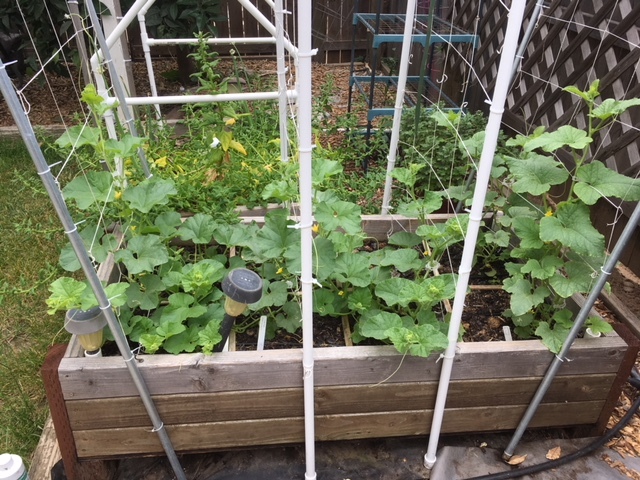 There is one cucumber that pollinated enough to grow, one unfertilized yellow squash, and quite a bit of male flowers. 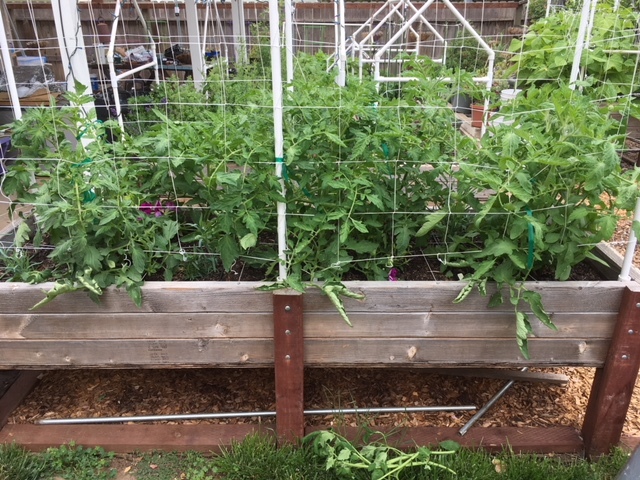 The tomatoes and beans have their first flowers. Now, if there were just more pollinators than the one bee and one bumble bee that are currently present. super impressive at your set up. Thanks, Has. 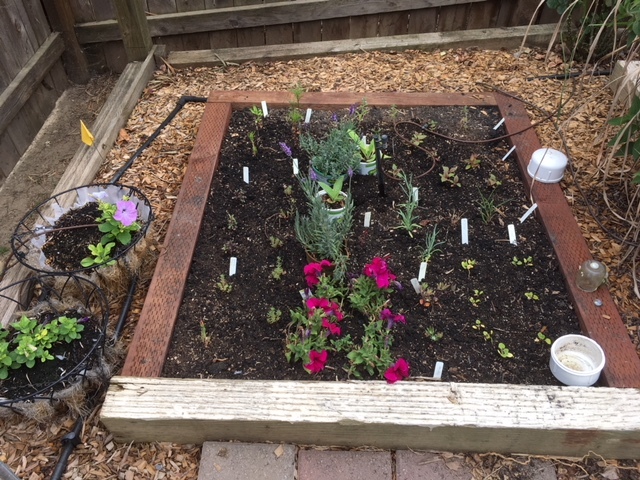 And, no one mentioned the weeds in the flower beds (wood chips). 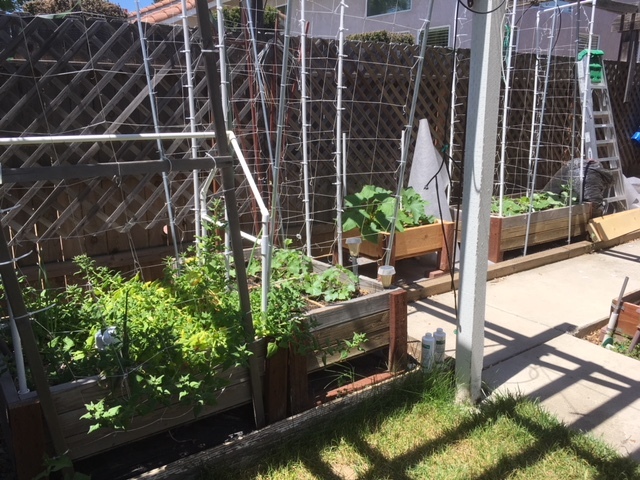 The back yard is my area of responsibility as it is herbicide-free (except for vinegar and Epsom salt in the cracks between the bricks of the patio). Ken has the front yard except for me planting flowers in the spring. @has55 wrote: super impressive at your set up. Standing on the patio, looking SSE. 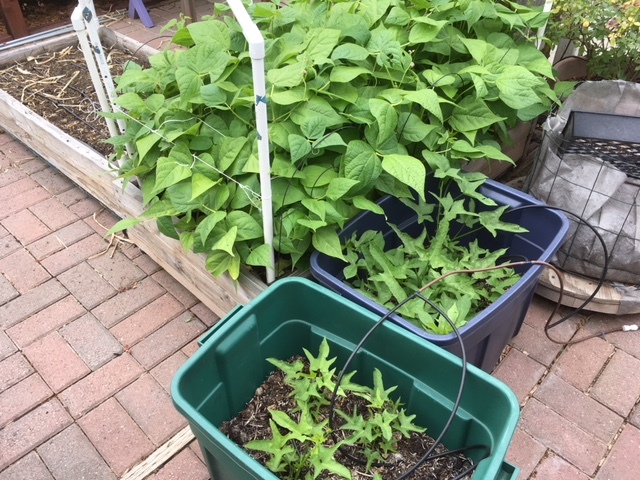 Tomato suckers in red cups, Dragon Tongue beans, sweet potatoes and some BTE tomatoes. The empty bed had the winter garlic, so I planted old soy beans. After 10 days or so, I figured they were too old. Then, I bought some Red Foliated cotton seed and planned to plant one per square. Yep, it looks like the soy beans are coming up. I'll just remove the middle soy and plant the cotton. Standing on the patio facing South. 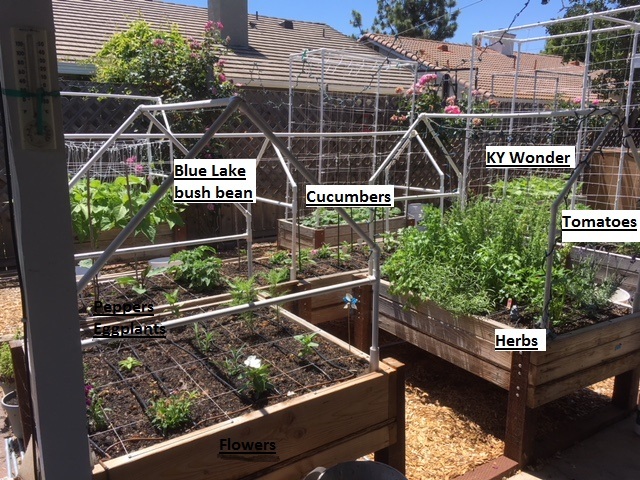 Background are the blue Lake bush beans. My favorite view from the patio. Looking SSW. 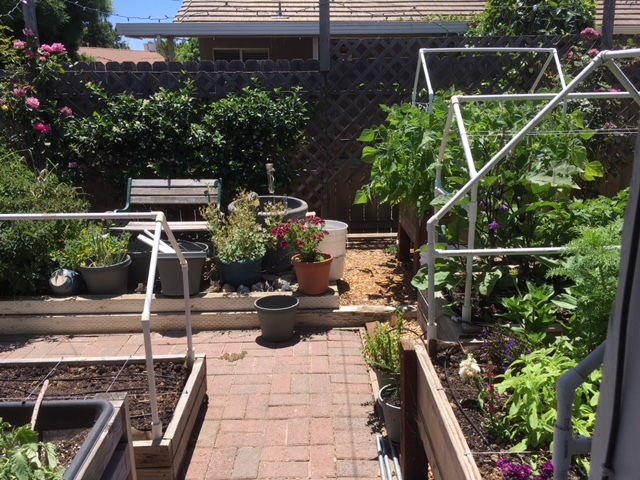 Looking SSW at the Blue Lake pole beans and the compost bin. 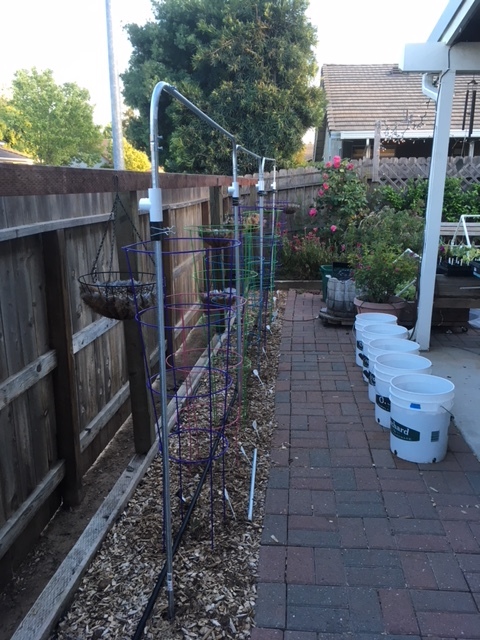 The white buckets with 3 tomatoes and 1 tomatillo need to be moved, eventually, and wrapped in aluminum foil. 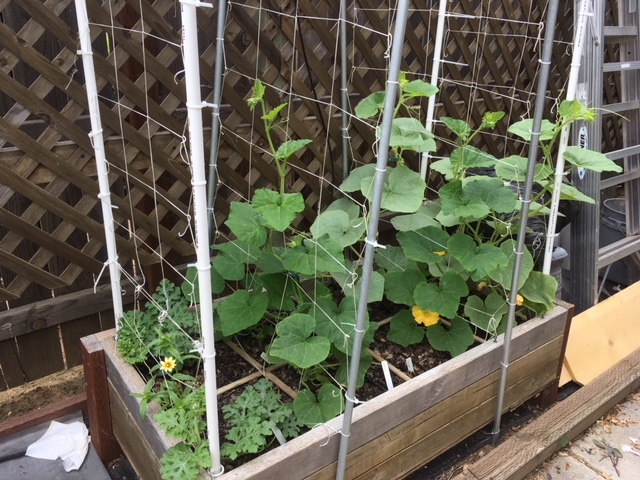 West side of yard with cantaloupe, summer squash and winter squash. The BTE tomato section with mixed results. Aluminum foil? Is that to reflect the heat? Have you tried looking for those cheap little insulated blanket mylar thingies? Would they work cheaper and be sturdier?